A rapid review of knowledge management (KM) reminds us that knowledge and knowing are not equivalent. This tension has been amply explored by a number of diverse thinkers and will be shared in the following paragraphs. “Cookie-cutter” solutions to organisational challenges ignore context. This is why they usually fail. It is thus critical to know where the people are at in organisations. The concept of Organisational Culture offers us this understanding. This culture encompasses the beliefs, attitudes and behaviour of an organisation. It is all about how things get done around here. High sociability has many positives like, free sharing of knowledge and high team spirits. It can have disadvantages too, like disagreement or criticism being avoided so as not to upset others. Under-performance from colleagues is thus often allowed to continue unchallenged. Solidarity is a measure of the members of an organisation to pursue shared goals, regardless of personal relations. Even if members don’t know each other, a clear commitment to shared goals will draw them together to act in concert. High solidarity has many positives like a robust response to external pressures and other organisational crises and very little accommodation of slack performance. But it also has drawbacks. These lie mainly in a take-no-prisoners attitude and merciless tussles for resources. When the above two dimensions are “cross-cut”, a revealing 2×2 is generated of the four faces of culture: Goffee and Jones point out that no particular quadrant is inherently superior; it simply shows how an organisation styles itself to cope with its environment. But fragmented cultures (even when they are positively manifested) are meagre benchmarks for organisations with more pressing delivery time-frames (a few years instead of some decades). Knowledge sharing is not a luxury, but a necessity in such modern organisations. Maish Nichani has done an astute meta-overlay on the Goffee-Jones (G-J) model, with respect to efforts by organisations implementing knowledge management. He super-imposes several complementary models onto the definitive G-J culture model, by projecting additional views, such as those touching on trust, process and style. Benevolence-based: belief that an individual will not harm another even when given the opportunity to do so – i.e. not expecting to be given the wrong information. Competence-based: belief in another to be truly knowledgeable in their subject area – i.e. seeking and trusting only those who are the competent. The iconic Xerox researchers, John Seely Brown and Paul Duguid, also pushed for the distinction between process and practice. They challenge us that “there’s a large gap between what a task looks like in a process manual and what it looks like in reality”. Practice: what actually takes place on the field. This rich, real-world arena contains a great deal of tacit knowledge. Process: what can be codified into rules and procedures. This is how the world is supposed to operate. Personalisation: This is a people-to-people approach. Here the focus is to link people with others and to foster networks and community of practices. Great faith is placed on informal knowledge sharing. Codification: This is a people-to-documents approach. Here the focus is on populating databases with best-practices, case-studies and how-to guides to aid people in their daily work (in extremum = just-in-time performance support). Reusable ’knowledge-objects’ is the mantra. Which KM approach works best? The best way to use this model is to first take a stance on which quadrant(s) your department or organisation fits into and then work your way through …and then make a case for the strategy for your initiative. I want to be more direct. 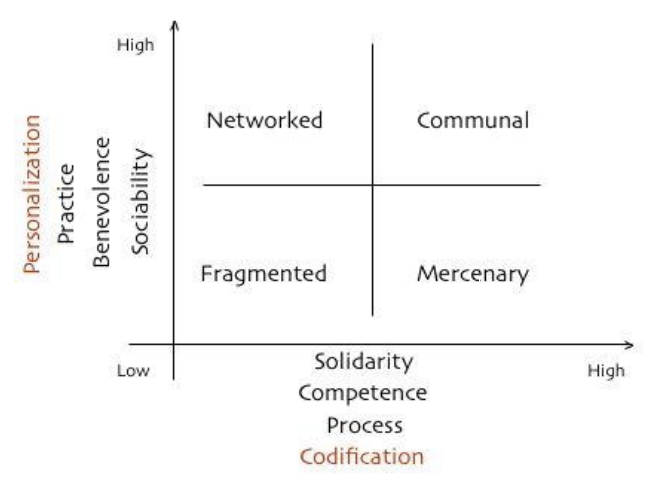 Traditional KM methods are strong on the theme of weaving together codification, process– and expert-centric models. This is found along the horizontal axis shown in the matrix diagramme above. And there’s the catch-22! Encouragingly, world-class organisations have long made peace with this inconvenient truth. And hence willingly made the large investments in fostering the poorly understood, but potentially very valuable, people-to-people mingling process. They also do not normally equate this particular outlay as building social capital, but this is what they are strongly contributing to.